As the season progresses, I will give a more detailed account of each opponent as game day approaches, but I thought I would give a quick overview of the upcoming schedule. The overall schedule will have the Leopards meeting 5 NCAA tournament teams and two final four teams including the NCAA national division one champion. Out of conference games are usually constructed to give your team a chance to reconstitute itself, as old and new team members are integrated into a smooth operating unit. The Leopards have a small jump on that process with a successful trip to Spain, as the extra days of practice and games with good competition have helped the younger players gain confidence. That is a first part of the process as new first year players will join the team on August 13. The first game will be with Ball State on on August 30 as they will arrive at Rappolt Field for the second time in four years. 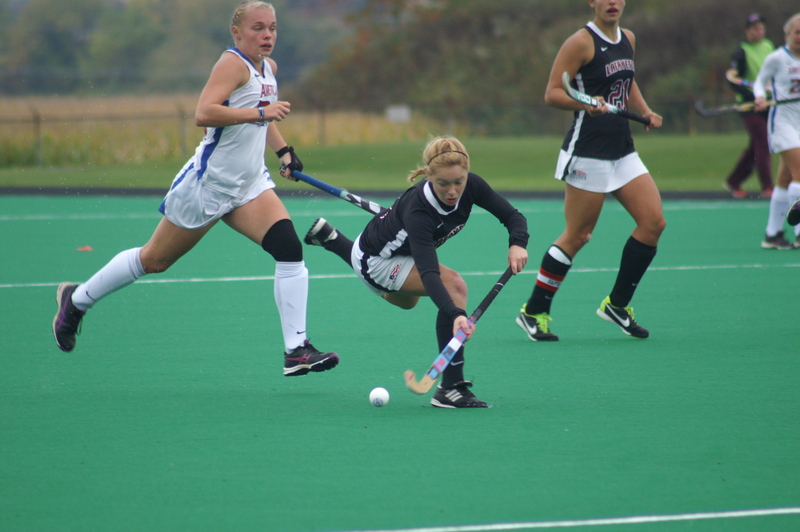 The last game with Ball State resulted in a 5-1 victory for the Leopards, but Ball State will come with a new competitive coach who will have a different outcome in mind. The Leopards will not enter the game cold turkey, as multiple practice days will be highlighted with two scrimmages, where the coaches will be able take a look at their charges in Division one competition. The first scrimmage will be a home event at 7pm on August 21 against Big Ten foe Rutgers University. Four days later the Leopards will board a team bus to New York to take on Columbia University on the afternoon August 25 for their final tune up. It is also the day before freshmen orientation and they will move into their new dorm rooms and participate in a series of meetings and events designed especially for them. The next game will feature Siena College as one of the ten home games scheduled this year. The Sept 1 game will be a night game at 7 pm under the lights.The Leopards will then travel south to Virginia to take on Longwood University for the first time in many years. The Leopards continue their tour of Virginia to take on the tough Liberty University Flames who won their conference last year and lost to UNC in the first round of the NCAAs 2-1. The Flames will be looking to avenge a 4-2 loss last year in Easton. The Leopards will begin to get into the meat of their schedule against an always tough Monmouth squad before taking on annual foe Quinnipiac who will be trying to avenge a 3-2 overtime loss from last year. On saturday Sept 19 Lafayette again boards a bus this time to Boston as they open their league schedule against last year’s league champion Boston University. Lafayette will be out to get their first win against the Terriers since they entered the League. Lafayette in both contests lost by 1 goal despite out shooting and out cornering their opponent. It will be an intensive weekend as Lafayette will go to Uconn to take on the two time defending national champion on Sunday the 20th. It does not get easier as Albany, a final four team from last year arrive Easton for a game on the 25th at home at night. A game with Drexel follows in Philadelphia on Monday at 7pm. October is dominated by Patriot League games which will decide which 4 teams will play for the Patriot League Championship and a coveted spot in the NCAA national tournament. There will also be games at the University of Pennsylvania ( the most played game outside of Lehigh by Lafayette field hockey), Temple, and Yale. The schedule provides the team with chance to blend together and contains opponents strong enough to give Lafayette an RPI high enough to earn a national ranking. In addition, it appears many of the Patriot League teams have likewise kept their schedules equally challenging, which should enable the league as a whole to advance Each team member has been provided a training regimen so that upon their arrival coaches can concentrate on orienting the team to game schemes and team patterns. It will be a challenging year set to begin in about three weeks. Recently, while visiting Total Hockey field hockey camp, I had an extended conversation with two of Lafayette’s veterans, Hannah Millen and Kirby Szalkowski. Entering their senior year this fall, these two roommates are determined to make the most of their last season on the Leopard’s turf. ” I suppose it’s a cliche,” said Millen, ” But this is our moment and we will try to make this a great memory for the whole team.” Millen is a history major and Szalkowski is a psychology major. Rappolt: Are you anxious about this being your senior year? Szalkowski: No, but we have been playing for the last 3 years and we intend to make the most of it. Rappolt: What game are you looking forward to? Szalkowski: Always the next one……So right now, it’s Ball State on August 30th!! It is always one game at a time and stay focused. Rappolt : Can you remember the obstacles you had to overcome as freshmen, and can you give any advice to your first year players? Millen: The biggest adjustment is the speed of the game and to be open to new strategies. Szalkowski: Yes the pace of the game is much quicker and requires faster decisions. Millen and Szalkowskow: It’s a hinderance not come to preseason in fit condition. There is a lot to learn and adjust to, and being out of shape is just another thing to be worried about. But that gets sorted out after the first beep tests!! Rappolt: Are you in contact with each other during the summer, and are you doing anything to integrate the new players. Millen: Every first year player has someone assigned to her to answer questions, and for help during the summer. We also have 7-10 informal practices so everyone can get together, and begin to feel like we are one seamless unit. Szalkowski: That is always an objective. We want to support everyone and feel like one team, not a group of individuals. We are going to be very tight, with one single objective on game day. Rappolt: Tell me about your experience in Spain. Millen: It was a great time to bond and I think we played very well. Barcelona and Valencia were beautiful and the beach was great. Szalkowski: It was great experience. I would love to go back!! Rappolt: Did your Spanish improve? Szalkowski and Millen: (Laugh) The effort was there. Amanda Magadan was our translator since she is fluent. But we all tried, and the local population was very helpful. Aside from the field hockey, seeing another culture and the beauty of the architecture left an impression on all of us. Rappolt: You played one game against a men’s side, any differences??? Millen: Yes they hit the ball harder, and they were very strong. Szalkowski: They had very accurate passing, but it was a great experience! Rappolt: What did you get out of it the trip, overall field hockey wise? Szalkowski: In the first game we were a little tentative but once we got our confidence, I thought we played well. That first contest we won 2-0 I think. Millen: The other game was in our favor 6-2 as we played as a complete unit, the men’s game was 0-5 but we learned a lot. The last game was cancelled because of a thunderstorm. But I really think we came together during the trip! Rappolt: Any last words? What will you be doing the rest of the summer? MIllen and Szalkowski: We are looking forward to the season, when we have the whole team in camp. Millen said she will be working for her uncle, and Szalkowski will be working earning extra money for the fall. Both will continue to play hockey and remain sharp. 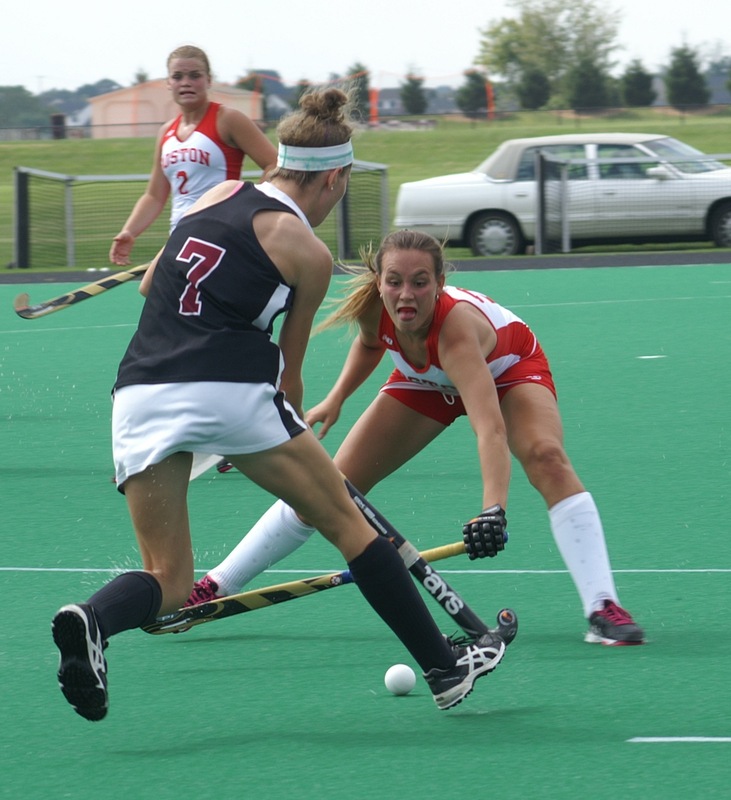 The Total Field Hockey Camp run by Lafayette head coach Jennifer Stone is giving high school athletes and rising college freshman a peek at training at the division one level. Work starts early at the four day camp as these young athletes are exposed the rigors and mental training it takes to be an elite level field hockey player. Stone has assembled her own coaching staff, ex-national team members, along with stars from Lafayette College to give team and individualized instruction. They are showed the requirements needed to become better in their sport including weight training, nutrition, psychological tips, and intensive game experience between camp teams After the organized sessions there is a chance to play with the camp instructors. 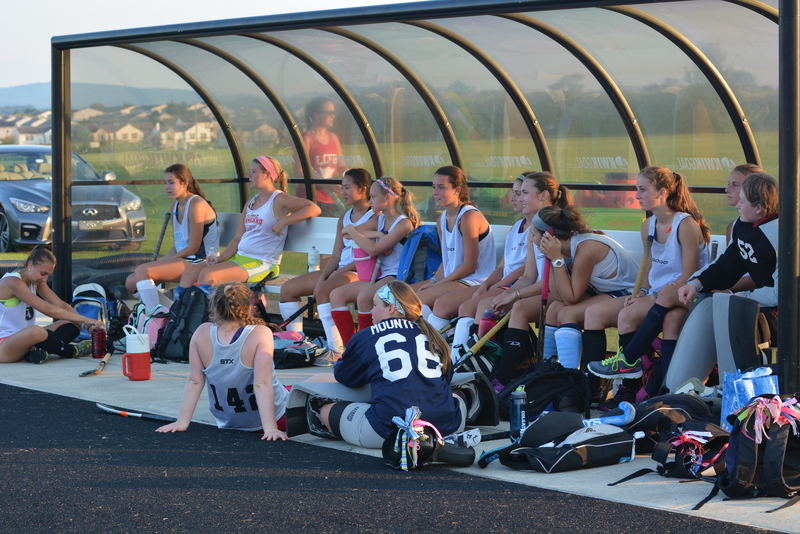 The camp participants play everyday on the state of the art astroturf XII surface, that is the exclusive field for Lafayette’s field hockey team. Aside from the exposure to the athletic resources of the College, the camper lives in the college dorms and can sample campus life on this 230 acre private school on the banks of the Delaware River. The camp is also populated by many of Lafayette’s 2015 recruits, giving the coaches a peek at their level of fitness and a chance to sharpen their skills before reporting for the official opening of preseason on August 13. Enthusiasm was rampant as nearly 90 pct of the participants stayed later after 9 pm to play against the staff on their own. In fact, my observation was that the intensity and spirit of these game was more intensive than the official sessions. It is not surprising that many of a school’s eventual recruits come from these camps, and I would speculate that this camp will be no exception. Personally, it was a chance for me see many of Lafayette’s new players in action. While the adjustment to the next level will not be without future hard work, I did see flashes of why these young athletes were selected to be Leopards this coming season. Samantha Broadhurst has a nose for the goal, Theresa Delahanty demonstrated good fitness, intensity and stick skills, Adriana Pero showed me her speed, athleticism,and hockey intelligence, Gabby Ulery has quick reactions and foot agility in the goal, and Liza Welch’s speed, athletic ability, and hockey skills demonstrated to me how her addition on the field will strengthen the Leopards this fall. In a conversation with two of Lafayette’s seniors, Captain Hannah Millen, and Kirby Szalkowski after the end of Saturday’s session, I asked what will these young players have to adjust to. The teammates both opined, the speed of the game is so much higher in college which will require fitness and quick decision making in order to be successful. ( Later on this week I will publish a more extensive interview with Hannah and Kirby). There is only one month before pre-season camp opens. After summer preparation is over, the Leopards will begin preparation for their first game with Ball State, and the championship season, but it is these efforts this summer that will spell success in the fall. 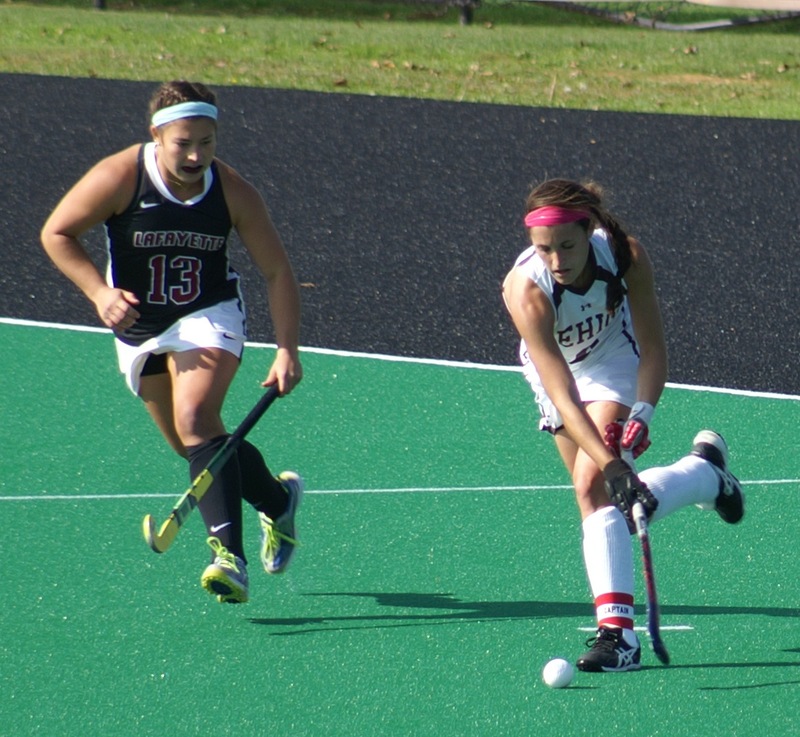 The selections have been made, and Amanda Magadan, Co-Captain of the Lafayette College field hockey squad, was named today to the United States under 21 team. Seventeen players were picked, and there will be five more selected from an additional test group. 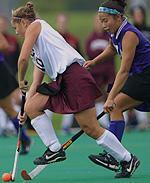 This the second year on the team for the junior midfielder for the Lafayette Leopards. The under 21 team will represent the United States in the under 21 Pan Am Games next spring. Madagan has already played against Canada and the Netherlands this past year as a member of the US squad.